Credit: del Portillo et al. A novel study indicates promising avenues in an innovative approach for developing a vaccine against Plasmodium vivax, the most prevalent human malaria parasite outside sub-Saharan Africa. The study led by Hernando A. del Portillo, ICREA researcher, and Carmen Fernandez-Becerra, Assistant Research Professor, both at IGTP and ISGlobal – an institution supported by "la Caixa" Foundatoin, indicates the possibility of using small vesicles (or exosomes) secreted by immature red blood cells as a vaccine platform against malaria. The paper, carried out in collaboration with IrsiCaixa AIDS Research Institute, was published in the journal Scientific Reports. Reticulocytes are immature red blood cells that in their terminal process of maturation selectively eliminate cellular proteins through the release of tiny vesicles termed exosomes, 100 times smaller than red blood cells. Previous work by Del Portillo group in a mouse malaria model had shown that exosomes derived from reticulocytes contain proteins from the parasite and could work as a vaccine when used to immunize other mice. By using proteomic analysis, the new study identifies 360 new proteins present in human reticulocyte exosomes. "This comprehensive list of proteins from these human exosomes represents a valuable resource for better understanding how the malaria parasite infects red blood cells," says Fernandez-Becerra. For instance, some of the new proteins identified are involved in the entrance of Plasmodium vivax into reticulocytes, thus partially explaining failure of in vitro culture systems, explains Miriam Diaz-Varela, PhD student and first author of this work. The study also discovered the presence of proteins called HLA-class I in exosomes derived from human cord blood reticulocytes (HuRex). Such molecules are in charge of unmasking protein fragments from the parasite so the immune system can destroy infected cells. 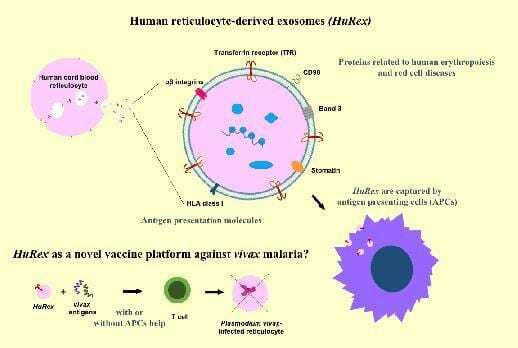 To determine if reticulocyte exosomes can trigger immunity against Plasmodium vivax, a functional assay demonstrated that HuRex are actively uptaken by dendritic cells, which are key sentinel cells that regulate the initiation of immune responses. "These findings converge with other recent findings in the field, and should spark new preventive cellular vaccines against malaria," explain Javier Martínez-Picado, ICREA Research Professor, and Núria Izquierdo-Useros at IRSI-Caixa. "Altogether, these results support further studies of reticulocyte exosomes from infections for vaccine antigen discovery and of HuRex as a potential new vaccine delivery platform for eliciting cytotoxic T-cell responses against vivax malaria", says del Portillo.